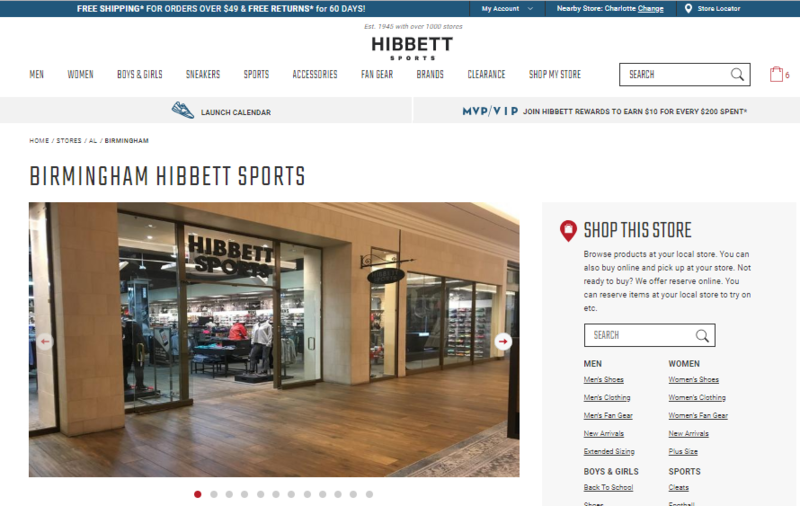 The leadership team at Hibbett Sporting Goods Inc. readily acknowledges that the Birmingham, AL-based retailer has been behind the curve on digital capabilities, but Monday’s launch of new online features is another step in Hibbett’s plan to close the gap on its competitors. Hibbett’s two newest service enhancements—Buy Online, Pick Up In Store (BOPIS) and Reserve Online, Pick Up in Store (ROPIS)—were announced Monday (click here to read the news item from earlier) and represent a second strategic digital move in five months. Hibbett in May unveiled a new mobile app as an integral part of its larger digital strategy. That launch, along with this most recent announcement, are part of the company’s overarching goal—meet customers’ digital demands by providing an omnichannel shopping experience and enhancing the value that Hibbett brings to customers. 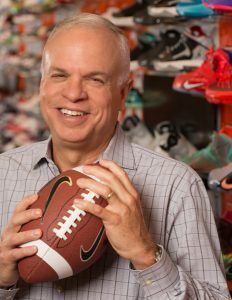 Jeff Rosenthal, Hibbett’s president and CEO, and Bill Quinn, Hibbett’s vice president of digital commerce, spoke with SGB last week about Hibbett’s digital strategy, including the BOPIS and ROPIS initiative. The new features allow customers nationwide to shop their local store on Hibbett.com and either reserve items or make a purchase before arriving at their nearest Hibbett Sports location for pickup. The company is pleased with the result, which Rosenthal and Quinn said absolutely needed to be top-notch in order for Hibbett to compete with competitors that have had these capabilities much longer. 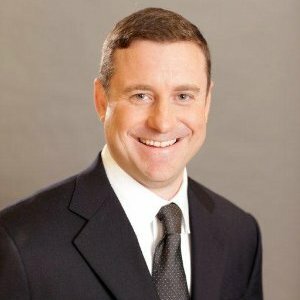 Hibbett’s decision to launch BOPIS and ROPIS at the same time is unique in that most companies roll them out separately, usually the BOPIS capability first, Quinn said. Hibbett’s surveys revealed that 60 percent of customers wanted “buy online, pick up in store” while 40 percent wanted “reserve online, pick up store.” That balanced response inspired Hibbett to pursue both solutions. Here is the rest of what Rosenthal and Quinn shared with SGB about Hibbett’s latest move to improve their company’s digital capabilities and become more customer-centric. What were some of the challenges with implementing the BOPIS and ROPIS features? Quinn: It was difficult to do them both at the same time. One big technical challenge with “shop your store” is it required the ability to know what every single store has at any moment in time and display that to the customer. From a design standpoint, there were also a lot of challenges because we were offering such robust functionality to customers, some of which they’re not really familiar with. And also the “shop your store” concept is very foreign because most retailers don’t have that function. But we spent a lot of time on it, and we also did a lot of usability testing. Once we were done building it, we had customers use it and give us feedback, which was invaluable and led to an even better product because we implemented their suggestions. The final challenge really was on the store execution end. The store pickup can be very valuable, but you could have the most beautiful interface in the world and it will all fall flat if a customer goes to the store and they don’t have it, or they cancel your order, or they have it but the customer has to wait while people are picking it for you. So there were numerous issues operationally that we wanted to avoid. We spent a lot of time internally talking about the issues that could come up and how we would avoid those issues. Nothing’s perfect, but the team has spent a lot of time on it, and we believe we’ve come up with a very good solution that really gets us past those challenges. You mentioned that 60 percent of your customers wanted BOPIS and 40 percent wanted ROPIS. How did you arrive at that intelligence about your customers? Rosenthal: It’s really just about asking customers and doing surveys to find out their frustrations or what would they like to see. Because in today’s environment, the customer is always right. We have to make sure that we’re providing the right service, no matter if it’s customer service at the store or customer service digitally, so we’re always asking those questions through surveys to figure out what they are looking for. You’ve spoken a lot about your stores being a strategic advantage because of your geographic footprint. Will that become an especially strong differentiator as Hibbett expands its digital capabilities? Rosenthal: Yes, especially in secondary and tertiary markets where it is more convenient for customers to pick up in store, because the customer will know that what they are looking for is in stock. It gives them the option of coming to the store to pick it up that day, and they don’t have to wait for a package to be shipped. They don’t have to wait two or three days but can go right to the store to pick it up. In light of other digital players out there, this is a convenience factor. Customers can rely on us that we will have it. Does this further embed you with your customers in terms of making the relationship a little stickier and making sure that they’re not going to shop a more established digital competitor? Rosenthal: When we started down the digital path of e-commerce, our customers said they want to shop 24/7. They want to shop in stores and they also want to shop online. So this is just an extension on giving them the convenience of both, and that way they know that they can rely on us to get that product. Do you have any tangible goals for the buy online and reserve online programs? Quinn: Typically retailers measure their “buy online, pick up in stores” revenue as a percent of overall online sales, and that has a pretty wide range to it. It could be anywhere between 20 and 50 percent of the items that you carry. It’ll be interesting to see what it is as a percent of the overall e-commerce business. On the reserve side, we’re certainly going to be measuring how many reservations are being made and the conversion rate on those reservations. The other thing that we commonly see retailers measure is the attachment rate. We know that when someone goes to a store they could potentially pick up another item while they’re there. So now we’ll be looking at all those different metrics and be able to tell if we are within average, above average, below average. How much do you project these new initiatives will impact e-commerce as a percentage of overall revenue? Rosenthal: The last quarter we said somewhere between 7 percent and 8 percent. We think we’ll get that number to double digits soon. Within the next year or so we think we’ll be in the 10 to 15 percent range. You’ve said the company has been “late to the digital ballgame,” but are you making up some ground here? Rosenthal: You’re never caught up completely because as soon as you think you are, there’s something new, some type of initiative that’s out there. Now that we have all the tools that we need to continue to compete, that doesn’t mean we stop here. We’ve got to continue to push the envelope and look for other ideas that are out there, and there plenty of other things that we can do. Did the launch of the app and now the launch of BOPIS and ROPIS give Hibbett a stronger digital foundation on which to build some of those other initiatives? Rosenthal: Absolutely. We’re adding new customers weekly, and that gives us more and more opportunity to be able to communicate with our customers, especially digitally. We can talk to customers more frequently; we can look at their shopping behavior, and we can be more personalized than we were ever able to before. What is next on the horizon? Is there anything specific that you can that you can discuss now that is going to be coming down the road? Rosenthal: There will be definitely be other things. One thing that our customers are asking us is to be able to ship to a store. Right now if you buy online we ship to your home. But we also see that there’s an opportunity to ship to a store, so they can pick it up there. Quinn: We do a lot of strategic planning, and we’ve also done a customer innovation study and survey, so we have many ideas from our customers. We’re currently evaluating those ideas to see which ones would be the best from feasibility and business impact standpoints. I can’t really talk anything more about that, but certainly we’re looking to really start to innovate. We have been innovative in terms of what we brought to market features—the app and now BOPIS and ROPIS—and we will continue to innovate. We definitely have a lot of good information to think about what’s next for us. Photos courtesy Hibbett Sporting Goods Inc.